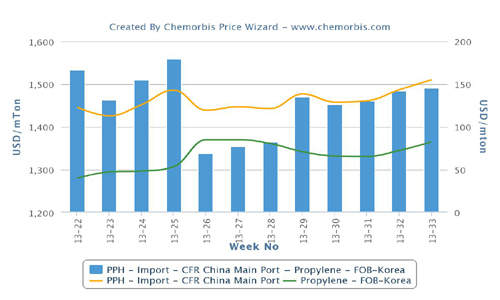 The upward momentum of the PP and PE markets in China was resumed after players returned to their desks this week from the New Year holiday, according to ChemOrbis. Domestic producers raised their prices by CNY200-400/ton ($32-65/ton) with PP prices witnessing a comparatively larger gain compared to PE. Local distributors attributed these price hikes to stronger monomer costs along with the lack of sales pressure on the producers’ side. “Major domestic producers appear to be feeling comfortable with their stock levels and we believe that prices will remain firm until at least mid-March, although the longer term outlook will depend on the strength of demand,” argued a distributor. The import market continued to move higher as well with new March offers indicating increases of up to three-digits this week. Players reported that deals have already started to be concluded on the low ends for Middle Eastern origins. “Limited availability and firm upstream costs continue to support firm market conditions for the near term,” commented several distributors. Nevertheless, they pointed out that the high ends of the current ranges see little interest. 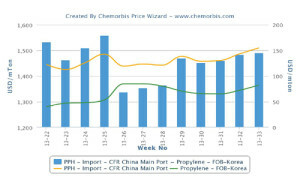 According to ChemOrbis, players in China concur that the sentiment for the second half of March is not as strong as it is for the first half. Some argue that previously secured cargoes for PP and PE which are currently on the way are likely to alleviate the current tightness once they arrive by the end of the month. “It is not easy to gauge demand from converters either as they are yet to fully resume their operations,” added another trader.